Combat success requires not only raw power, but effective stealth and adaptability to changing battle scenarios, as well. 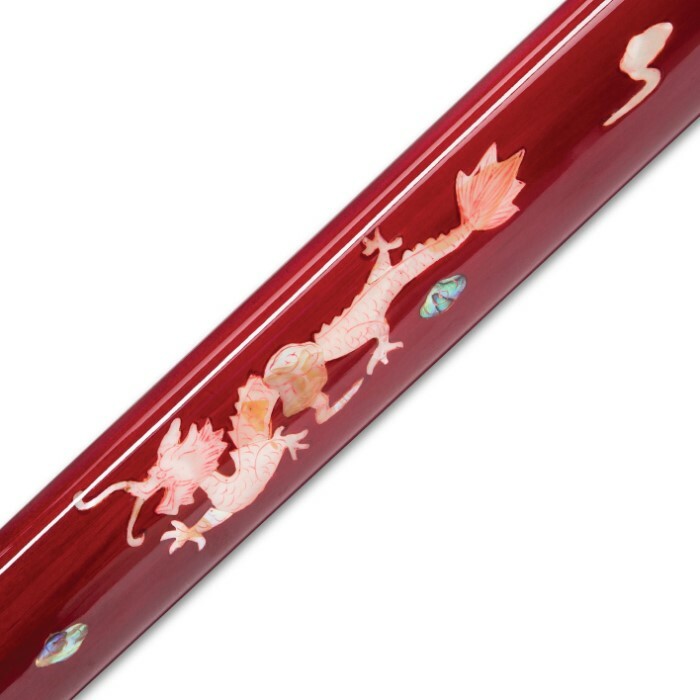 That's why ancient Japan's famously lethal ninjas relied on discreet, easily concealed weapons like Shinwa's "Scarlet Komodo" Tanto - a small-yet-capable traditional Japanese short sword. 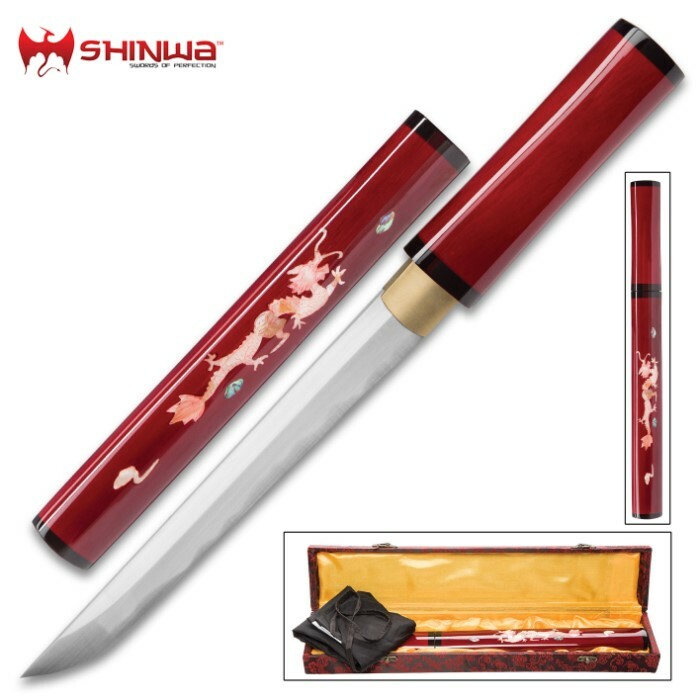 Despite its shear strength and legendary potency, the storied katana is imposing and, consequently, conspicuous and wholly useless in covert operations. The Komodo, however, is easily stowed beneath garments - completely out of sight - a "hidden dragon" lurking in the shadows, waiting to ambush his prey. 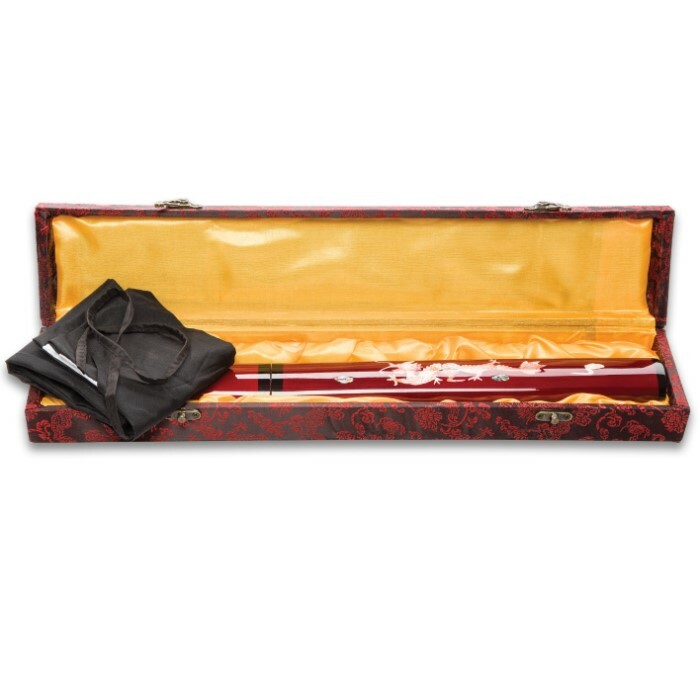 Fittingly, the hand-lacquered hardwood saya is adorned with a breathtaking dragon motif, inlaid with stately ivory-colored bone and glittering mother of pearl. A quintessential example of the sleek, no-frills "shirasaya" configuration, the saya merges seamlessly with the likewise-finished hardwood handle. With no obtruding components like a tsuba, the shirasaya is easy to comfortably tuck away on your person, without looking out-of-place and, therefore, suspicious. Add the tanto's ultracompact profile, and you've got perhaps the best covert short sword available. But don't let the Komodo's slight scale fool you - it packs plenty of ferocity and muscle in its carefully honed, razor sharp tanto blade, painstakingly hand forged from choice 1045 carbon steel by Shinwa's seasoned swordsmiths. 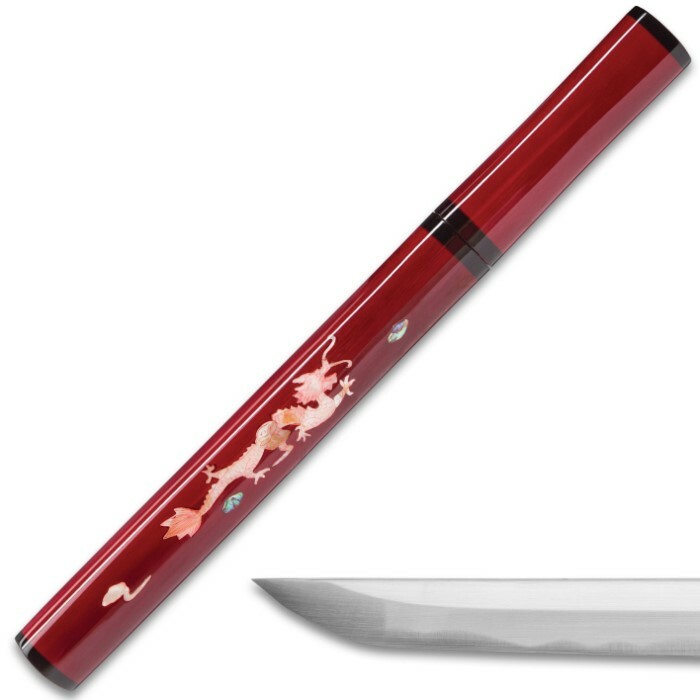 Upon wielding the Komodo for the first time, you'll understand why it's not classified as a mere "fixed blade knife" - placed, instead, among the ranks of the fabled katana, wakizashi and other traditional Japanese sword legends. The Komodo boasts a solid, weighty feel, and the blade is exceptionally robust - stronger and more resilient than cheaper, less labor-intensive cast blades by many orders of magnitude. 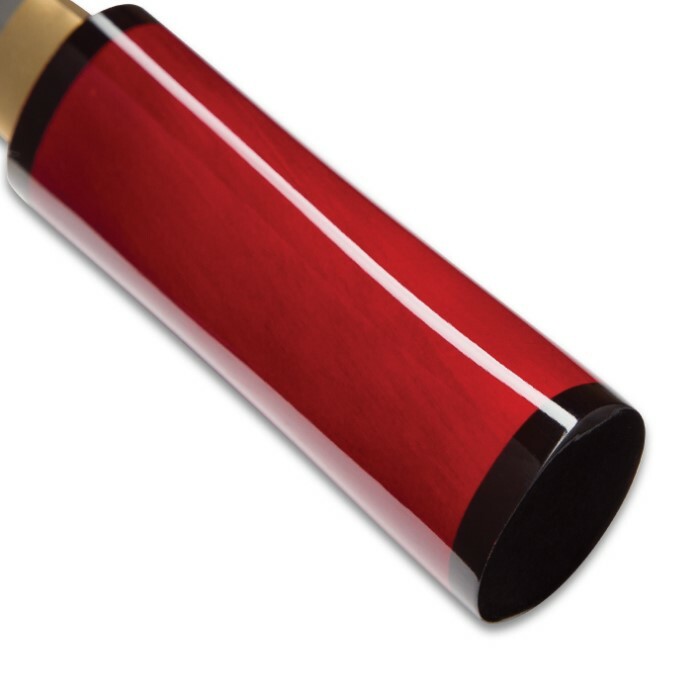 Whether you're a latter-day ninja seeking a reliable, effective, easily concealed bladed weapon; a collector wanting to diversify his or her personal assortment of sword varieties; or even a first-time sword buyer dipping his toes in the proverbial "sea of sword enthusiasts," Shinwa's Scarlet Komodo Tanto represents a perfect solution. Though comparatively small, the Komodo's charm, allure, value are colossal, and when shrewdly wielded, it can clash toe-to-toe with swords many times its size.